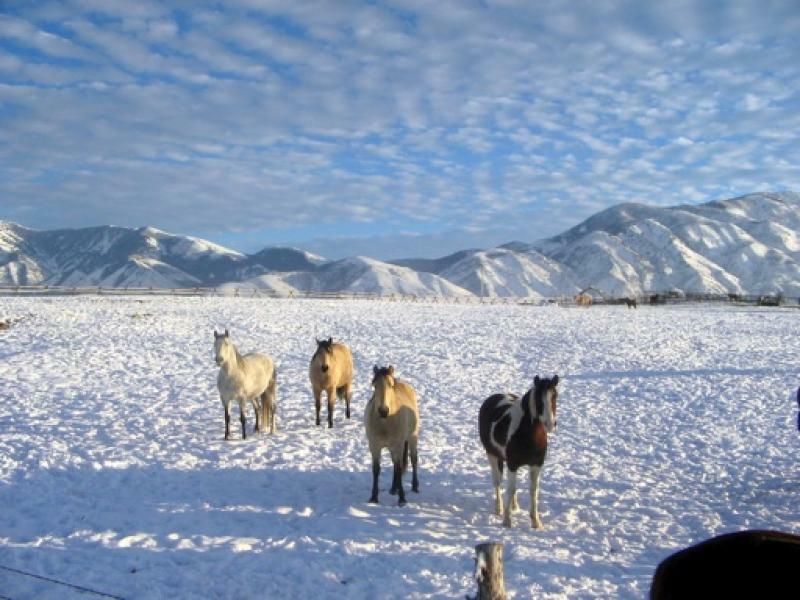 MO Foxtrotters strives to breed horses with great dispositions, gait, and good conformation. Color is a bonus! Many of our foxtrotters are champagne in color and are double registered MFTHBA and ICHR. 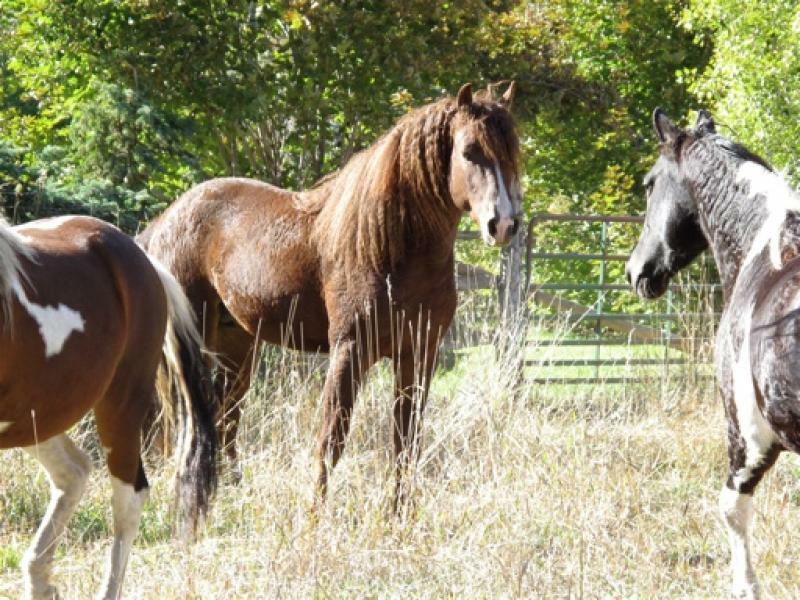 We also have rare sooty buckskins & black based dapple greys. "Mansey" is a 1998 classic champagne (black base) grey mare. She is double registered MFTHA/ ICHR- #336. "Mansey" has a great disposition, is people friendly with great gait and lotsa heart. She is big bodied, an easy keeper and stands 15.2 hands. Needless to say, she is our families' favorite horse. She produces good foals with pretty heads and great dispositions. "Mansey" has "Black Cloud", Cap's Iron Duke", "Zane Grey", and "Mr. President' breeding. 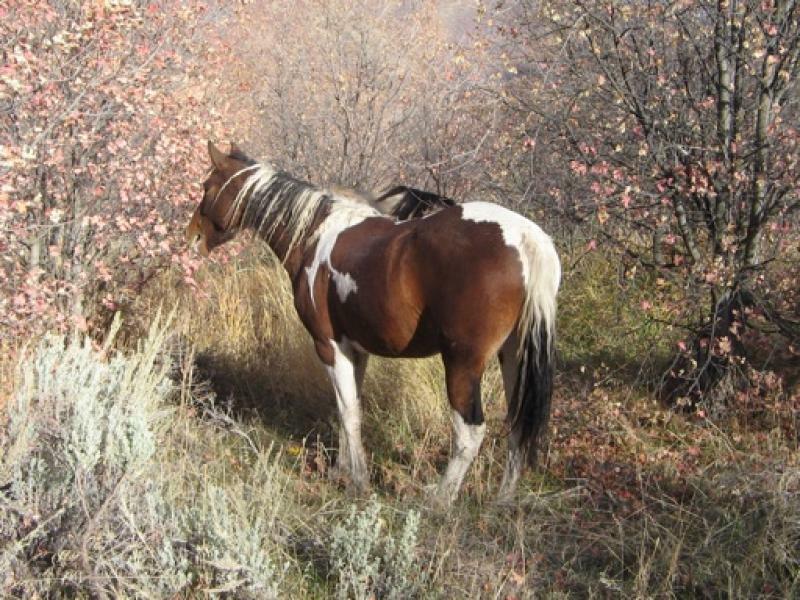 "Roxy" is a 2002 amber champagne (bay based) mare, no white. She is double registered MFTHA and ICHR- #337. 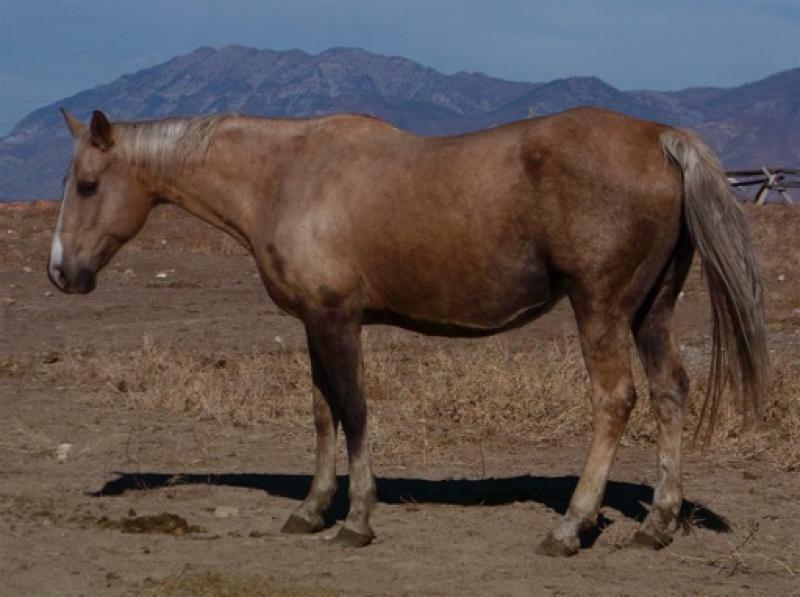 Roxy is a big boned, big bodied (easy keeper) mare standing 15.2 hands. She has a great disposition and a fast smooth running walk. She and her mom are "Cover Girls" for the summer '05 ICHR Publication: www.ichregistry.com--- This mare turns heads! 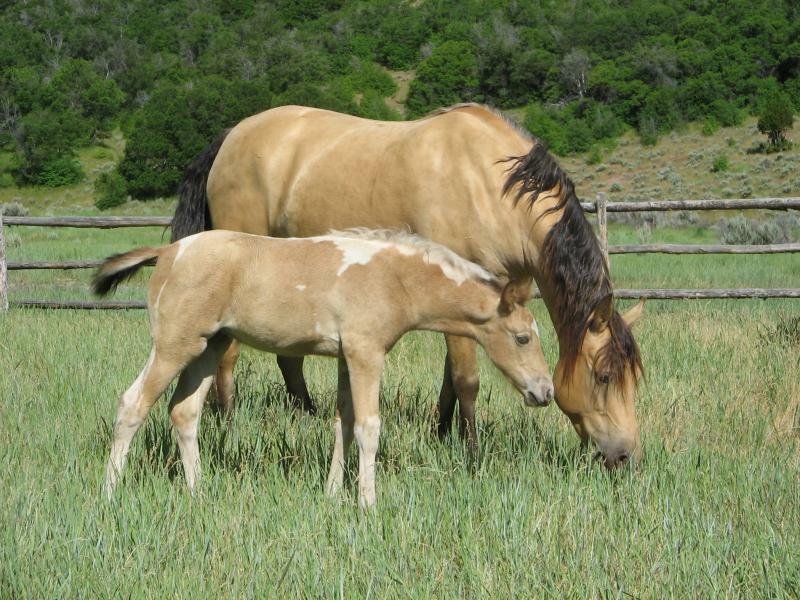 Photo is of "Roxy" and her '07 filly: "Rock Star"
"Stardust" is a 2003 buckskin mare. She is 15 hands with an slim build. She is super sweet, loves attention and is easy to work with. She has tons of go and gait. Great breeding, awesome horse, in one pretty package! Fall 2008 we went on a pack trip with our family. We had a great time and the horses were awesome. 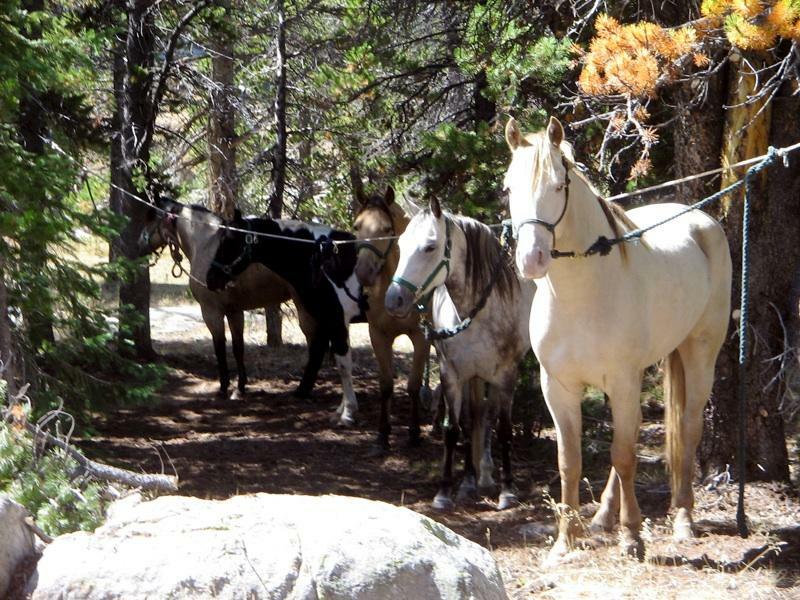 I sold three of the horses we had planned to take, and so I hobble broke 4 of my brood mares and got them in shape! They were like---WHAT? We have to WORK? But they were awesome and we had a great time! 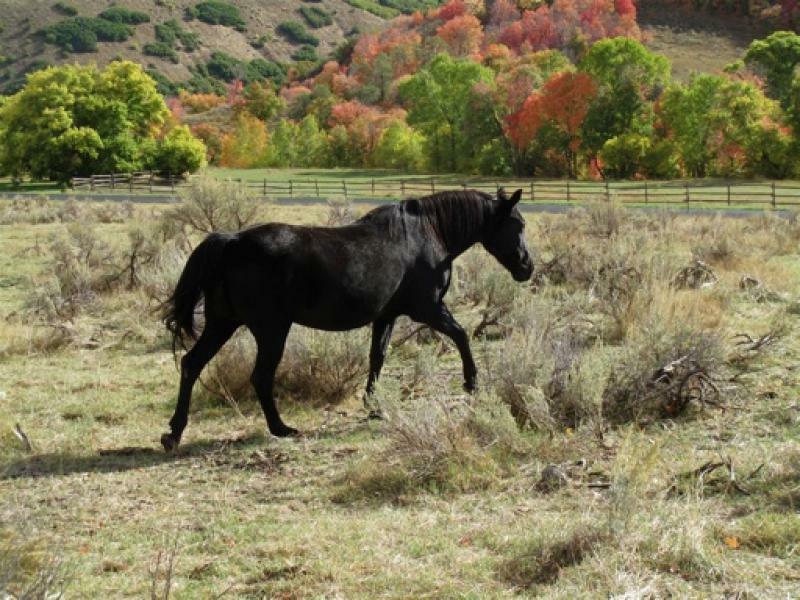 "Taboo"--"Boo" for short, is a 2006 solid black mare. This gorgeous filly is out of my personal favorite 16.2 hands tall mare-- "Gypsy". "Boo" is "Gypsy's" first filly , so we are excited about this girl. She is super sweet, friendly, and is one nice mare! Her trainer said "Riding that mare was like having a day off!" We have used her as a pack horse also. In one week, she packed out three deer and helped pack out two elk! (No I am not telling where!) 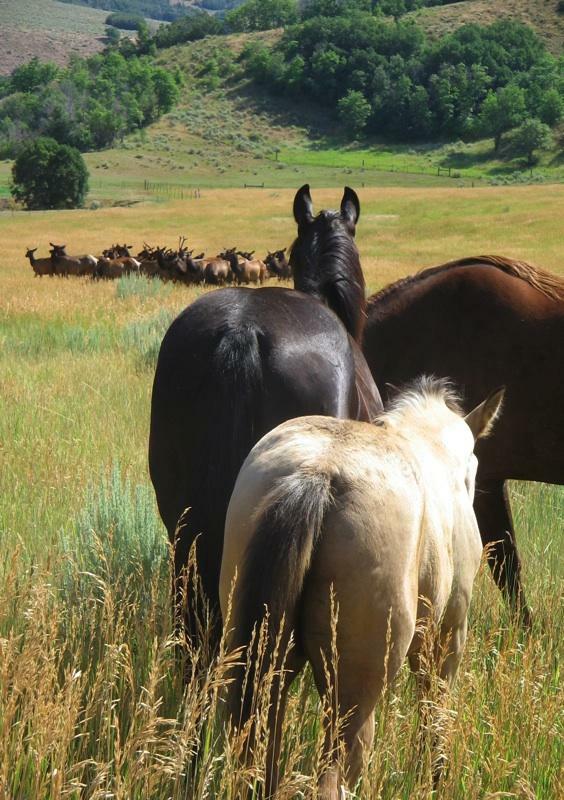 Photo is of "Boo" and some pasture buddies. "Liberty" is a 2004 bay and white dominant curly foxtrotter. She is sweet and easy to work with. She is a great addition to our registered curly foxtrotter breeding program. The sky was amazing with the cloud/ snow patterns and colors ! Poor girls were a little put out that I was snapping pics instead of feeding! Expecting some good things in 2015! Never say NEVER! Thought I would never own a CREMELLO! --but here she is! 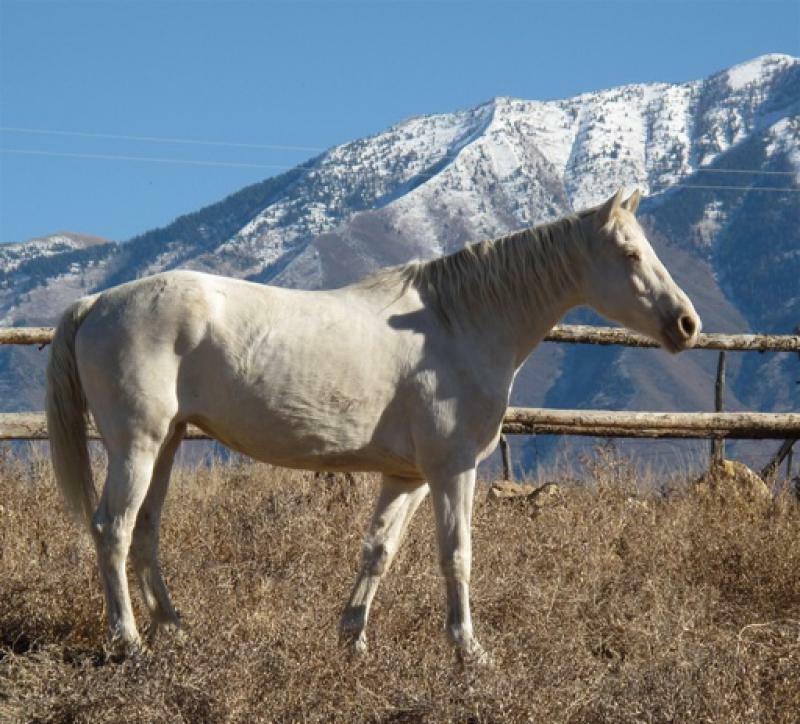 "Creme" is a 15.3 hand mare that is sweet to the bone, has great conformation , deep bodied, gait and breeding! Yes, the "D" indicates she is a Dansie bred mare! I am told she is out of one of Dansie's favorite mares- "Southern Dancer". "Sweet Creme's" top line is the same breeding as "Gypsy", one of my favorite mares. 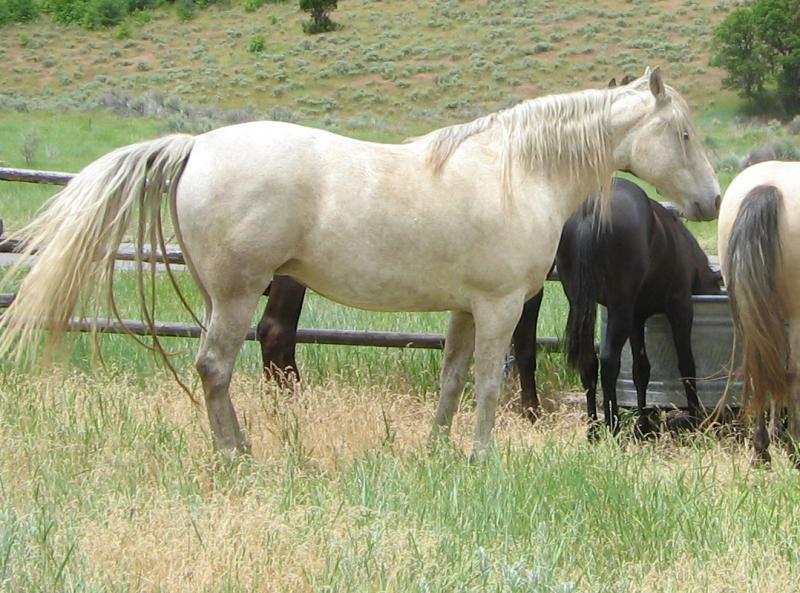 (Deceased) "Cream" also goes back to "Lad's Grey Shadow", a stallion that I owned and loved for a couple years. "Cream" is producing awesome foals when crossed with "Dallas"! 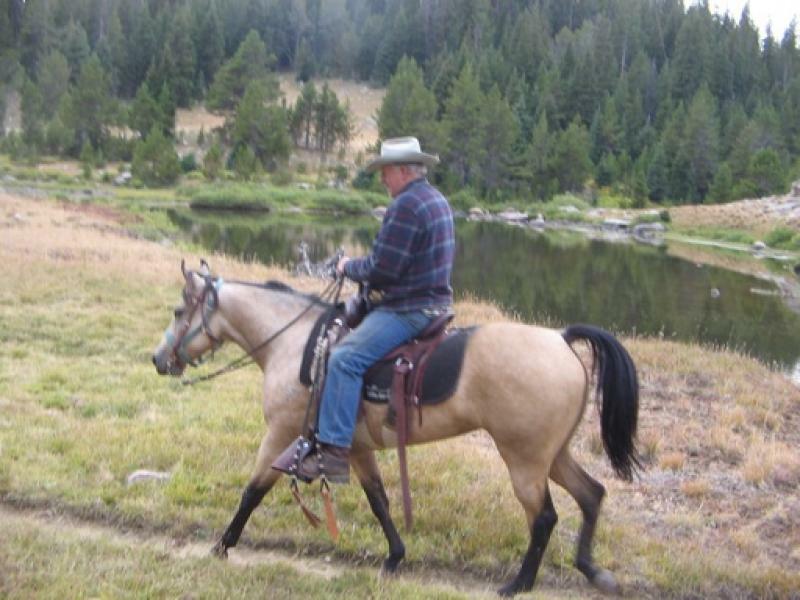 "Foxy" is a gorgeous dark 2002 palomino mare with dark legs! She is Rex Anderson's "Prospector" breeding, super disposition, gait and conformation! Can't wait to see what she produces when crossed with "Dallas"! Click on mare's name for more photos! "Curly Sue" is a triple registered curly (ICHO & ABCR) fox trotter (MFTHBA) red roan 1999 mare. She is 14.2 hands and cute as a button! She is not related to our stallion "Dallas" so she is a great addition to our curly horse program!